People ask me about what type of outcomes I create when shaping experiences for products or services, and what type of information should these look to include. In response, the next two blogs are going to lift the lid on the type of artefacts we create for our clients during a formative research, design and/or evaluative research engagement. When creating user experience (UX) outcomes as part of any engagement, it's not simply about the style of how these look. I've been working as a UX professional for over 11 years, so I've had a lot of exposure to the varying type of templates created to represent the relevant message. The key element throughout any template created is to focus around the quality of the content and the message that's being conveyed. UX is not about style...it's about the substance, structure, quality and reliability. This blog will purely focus on the outcomes created as part of formative research activities, whilst the next blog (live on 20th October) will focus on UX design and evaluative research. A persona is the representation of a formative research exercise with people who represent the relevant key user groups, conducted through qualitative and/or quantitative studies. It typically describes the characteristics, frustrations, prioritised key needs & goals, key barriers and success factors of key user groups who will be interacting with the software, website, application or system. For instances where no personas exist and no research is scheduled (due to time or cost), a proto-persona should be used to identify the core user groups and document assumptions/facts. A customer journey is where we start to understand and plot a customer's complete involvement in how they interact with the product (before, during and after). Across a high-level view we plot the emotions they'll be feeling at different stages, the device types they would typically use, any drivers as to why someone would potentially be looking to complete a task, a summary of key interactions with the brand (including a quick mock-up where relevant) and relevant milestones, and how they'll be served once they've purchased a product. User flows are high-level diagrams that show all potential user journeys for how all key users will complete a range of common tasks. This flow makes it easier to identify all the various pages and loopbacks, across varying devices, and highlight any key architectural considerations (such as what database will be interrogated to bring back the relevant stored data). 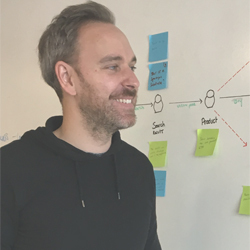 User journeys provide a detailed step-by-step flow of a key task to understand the different steps the user needs to complete before reaching the required goal. These user journeys detail the objectives of each page/step, key features & functionality to aid completion of the page, assumptions being made, any technical considerations and ideally a reference to relevant user stories. As part of any formative research engagement, a persona is the typical outcome created to represented a summary of key characteristics that represent the key user groups. However, there are instances when these findings are required to be documented and presented in isolation to a wider audience as part of a commissioned piece of work. There is greater emphasis on creating context, positioning and detail within these reports, which is reflected in the granularity of information/data and the presentation style of findings. Our engagements with clients vary, whether that be utilising our complete user experience and development expertise, or requesting a one-off piece of commissioned formative/evaluative research, or utilising client's research findings and help them represent these needs into intuitive, engaging, innovative and relevant responsive concepts. We work with you to understand your business and digital ambitions so we can recommend how best to achieve these. Come back on 20th October for part 2!